The SatKing Pro Max Fully automatic motorised satellite TV dish system is the most advanced system on the Australian market, utilising the latest in flat panel antenna design. 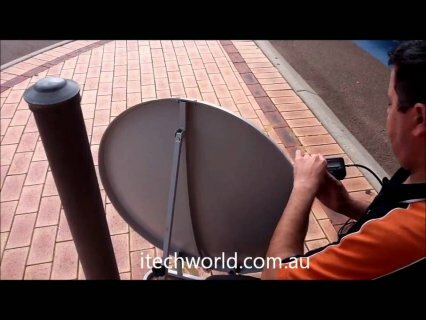 This motorised satellite system suits Foxtel and VAST satellite TV. The unit has dual LNB outputs to suit twin tuner STB’s like Foxtel IQ/Austar MyStar and VAST twin tuner receivers. The SatKing Pro Max is very simple to use simply turn the unit on and the built in GPS system will locate your required satellite very fast. Another great benefit of having a built in GPS system is that if you forget to return the unit to the home position the motorised dish will automatically retract once the vehicle is travelling above 10Kph (the unit does require 12v or 24v power). Flat panel satellite antennas also take up a great deal less space on the roof of your van leaving you with more choices for the exact location on your roof in between solar panels and air conditioners. Flat panel satellite TV antennas offer higher signal gain than equivalent size offset round type satellite TV dishes. The SatKing Pro Max moves on 3 axis meaning the old days of having to manually get up on the roof of the van to adjust LNB skew (turning the LNB clockwise or anti clockwise) when you are travelling from say Melbourne across to Adelaide and then to Perth are gone. The complete head of the antenna simply adjust automatically for you. Automatic skew will also improve the signal quality to assist you further. The Promax can receive both DVBS and DVBS2 transponders (SD & HD MPEG4), this means the Promax can actually tune to all transponders available on both Optus C1 and D3. The added bonus of having the DVBS2 tuner already built in is that when Foxtel goes completely MPEG4 the Promax will continue to work (VAST is already MPEG4). Many other units on the market only can tune to the older MPEG2 signals, that is fine today but in the future you will have problems. Installation is easy, simply apply Sikaflex to the underside of the mounting plate and then fix the plate into a beam in the roof of the van, the Promax then fits on to the plate with just 4 nuts. Position the waterproof cable gland so the cables can drop into a cupboard (make sure this area is clear of existing cabling or piping) drill a 20mm hole and then fit the gland and apply silicon around the cable cover. As per the labels on the cables fit the receiver cable to the "sat in" on the satellite receiver and the "receiver" on the antenna and the connect the controller cable to the controller inside the van and to the "Controller Port" on the Promax. Press the power button and select the satellite you want to watch (VAST is default) and you are watching TV. The SatKing Pro Max is precision made for Harsh Australian conditions, it is rugged in construction with all main drive gears being metal for long life. The unit is backed with a 3 year Australian warranty. The unit is made in Korea, Korea is famous for making high quality and latest technology products. The SatKing Pro Max comes with detailed instructions for self installation or your local caravan dealer can install the unit for you (charges apply). We can also recommend an installer for you nearby to your location, just give us a call 1300 139 255 or email us at sales@satking.com.au. We also have dealers Australia wide that you can purchase from direct. You may wish to have the SatKing Pro Max as standard equipment when you order your van, let you dealer know and they will organise with us directly for you. The Pro Max may have already been installed on your van when you purchased the vehicle, no problems we will still give you all the support you require just give us a call. Peace of mind, this unit is supported by SatKing’s 1300 Help line (4 staff) to assist with your initial set up and support you as required along all of your travels. SatKing is a large Australian owned company with a government approved satellite receiver so we are here to stay!